~ Many thanks to Paul Asimow’s Snowy Owl pages for the above excerpt. 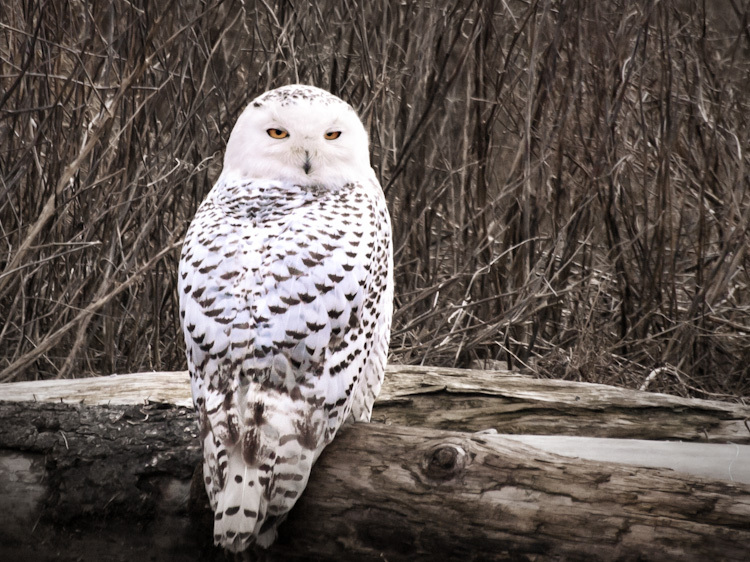 We don’t yet know if it’s an echo year for Snowy Owls (the year after an irruption), but the Bubo scandiacus are once again planting their furry feet on rooftops, sidewalks, meadows and in fir trees around Seattle and the Pacific Northwest. I photographed this Snowy in Seattle’s Capitol Hill neighborhood this month. She was dozing in someone’s garden with a branch draped in front of her forehead. I snapped a few shots and kept on walking, not wanting to disturb her after a “hella long” migration from the Arctic tundra. 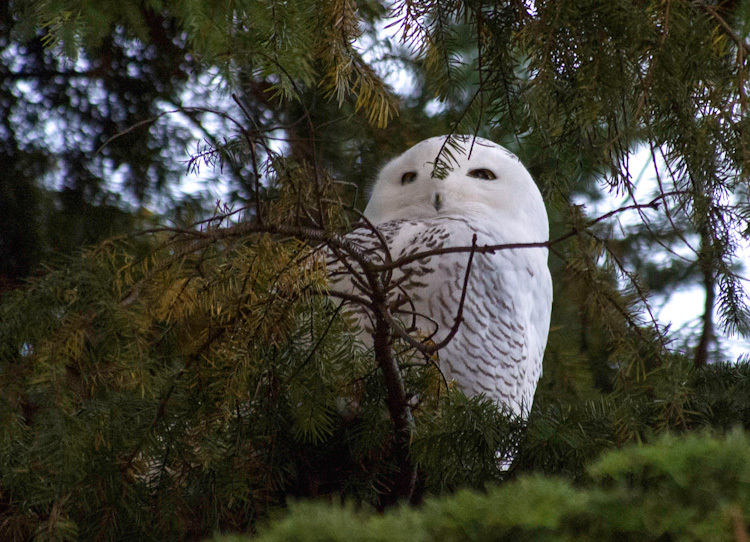 She was the second Snowy Owl in a week to appear in this dense, urban neighborhood which sits on a hill just east of downtown Seattle. The first Snowy drew a small fan base after she landed in a residential driveway with her dead prey. This same Snowy Owl, too placid from hunger to evade urban dangers, was picked up the next day by Sarvey Wildlife for some regenerative care. Larry Hubbell of the Seattle-local blog Union Bay Watch wrote about that particular owl and her positive recovery at the wildlife center. Sightings of Snowies followed on nearby Queen Anne Hill, in Discovery Park (my neighborhood), and in Tacoma, south of Seattle, where this short video shows a Snowy recovering (poor owl) after hitting a window at the News Tribune office. We’ll see where the rest of 2012 takes us in terms of Snowy Owl sightings. I will, of course, be looking up toward rooftops and trees as I always do. I’m not sure why Capitol Hill, one of Seattle’s hippest, coffee-rich, tree-lined neighborhoods, appeals to Snowies. There’s no permafrost and there’s a shortage of tundra moss. I’d love to get inside the mind of Snowy to answer this question (among others). That’s why when a Facebook friend recently asked which super power I would choose if I could have one, I picked Dr. Doolittle’s animal communication skill … even though I’m not sure it qualifies, technically, as a super power. Ahhh, the beautiful and enigmatic Snowy Owl. For me, these birds bring mixed feelings. I’ve never seen one in the wild, and would dearly love to. But on my own terms – just me and the bird (I’d hope Mia would be there too) in a quiet setting where I could be in its presence. I’d love to take photographs of it of course, but that would absolutely be secondary. But when these owls irrupt down south they bring out the scoundrel in too many birders and especially photographers (not the owl’s fault, of course) and I despise what it all too often does to the birds, and to us. Last winter, when one was reported (and photographed) on the causeway to Antelope Island, I actually cringed because I knew what scene would play out if the bird stayed around. It didn’t and wasn’t seen again. I hope it’s still thriving in some remote place. Just my thoughts – maybe selfish ones on some level, but they’re honest. 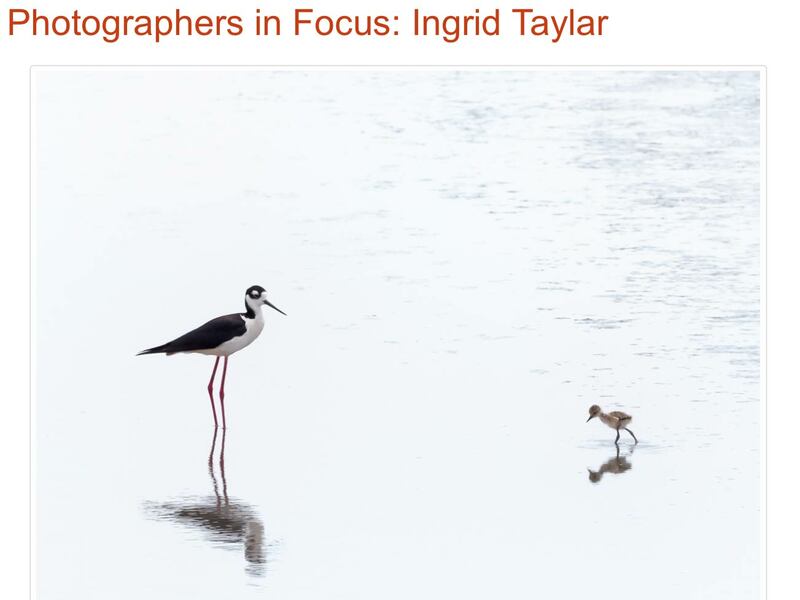 I always enjoy your posts, Ingrid and this one was no exception. Loved your title. Ron, thank you … and I always love your comments. You may recall that last year’s Snowy Owl irruption caused me great consternation and a few ranting posts about how photographers behaved in the presence of the owls. It was frustrating and heartbreaking and yet, I was on the scene for the same reasons they were. I wanted to see a Snowy Owl. I didn’t have much experience (prior to that) with rare bird frenzies and I don’t care to be witness to one again. I would give up wildlife photography before I’d stress the owls as some photogs had no problem doing last year. I completely understand why you’d like to be “present” with the owl, alone, with or without photos. If you were photographing, then I’d like to be a fly on a fence post, watching you and Mia work your magic through your lenses. Although this photograph is far from a perfect shot, it was refreshing that this urban owl had no human attendants, and I purposely didn’t stay and gawk, although I know she noticed me. I did hesitate about even lifting my camera and I rationalized it because the little OM-D is so quiet, barely a shutter click. But, given the history of Snowy Owl paparazzi, I did second-guess my choice after I did. I keep hoping I’ll see a Snowy Owl in my neighborhood. It’s a pretty mellow, residential neighborhood and if I came upon a Snowy on one of my strolls, chances are, it would be just me and her. And I could have an urban version of the setting you describe. Preferably after a rare Seattle snowstorm. Thanks, Ingrid. I figured you’d “understand”, and you did. I think it’s so funny you added those audio/video clips which made me laugh. I’ve also had pets that I felt as if I could “talk” to them, yet when I do, I know it’s my old human dialect. Ingrid, I’ve also discovered that as we age, words become less necessary, and I feel safer everyday by using less wordage. This has taken me years to learn. But also it’s also what my work with hospice has taught me: words become superfluous with time; whereas actions, gestures, sounds, and touch are what the dead and dying understand. I think the same applies to animals. “whereas actions, gestures, sounds, presence and touch are better understood in the process of death and dying”. “Dead and dying” is not be confused with “death and dying”. Dead and dying is a situation where there is dead and dying people together. “Death and dying” is the process of dying itself and it was what I was referring to. Totally understood, thank you, Maria. I was touched by your comment about words becoming superfluous over time. I often think that animals have much more sophisticated means of communicating, and we underestimate them at our moral peril. They function almost seamlessly in their words, whereas we must resort to the clunkiness of imperfect language to navigate ours. Beautiful sentiment. Thanks. Larry, whenever I get homesick for the Bay, I remember that if I weren’t up here right now, I probably wouldn’t have seen (and may never have seen) a Snowy. It’s been a treat to see such a magical bird, all chaos surrounding their presence, notwithstanding. Nice words and agree, the circus of 2011 was less than agreeable on the coast and I never went down past end of December. But there is hope-pick a shadow year…. and a day where the weather is not perfect.. mid-week..and you will most likely have a nice encounter or two with one of the most amazing birds in a peaceful setting. Thanks, John. And yes, I’m putting the OM-D through its paces. My relatively new 50-200mm lens is underused simply because most of my photos now are urban, as I’m out taking a break or a walk. I haven’t done a dedicated wildlife excursion or outing in a while and my better lens seems like extra weight on a stroll when I don’t know if and when I will see anything. I am, however, looking forward to maybe getting some decent eagle shots with it this winter. Hi Ingrid, no hunting at Damon Point, it is a state park and I have never heard shooting on the ocean side or the harbor side. If they were to hunt, I am sure they would very well away so it is a nice place. Alot of very nice creatures to see..mammals..seabirds.. some nice agates and petrified wood. It is a very neat spot, not a good place to be standing if a Tsunami were to hit as it is a finger spit. It is usually windy and cold but just right ! Thanks, John … and sorry for the delayed response here. As you probably know, the Tweeters list doesn’t allow people to even bring up the subject of hunting (although some do) and I often want information just like what you provided. I know trial and error is the next best thing, which I’ve been doing with some successes and some fails. Maybe next year, when I’ve had a year to recuperate, I’ll be up for the challenge again. Tweeters is an example of a group that most mean well…now, some downright don’t-the ilk that look to kill trophy rare animals and use the info on the site to find them, and alot of plain overexposure of sightings to the detriment of the birds themselves. Greed. Perhaps when the non-hunting stamp money idea that you are championing can take flight there can be huge chunks of land preserved for the creatures and not the hunter or birder to interfere. Only problem with those Snowy’s is that it might be a decade until they come back…. and I bet by next time they will stop human Damon Point visitation or it will be gun range…..
John, whenever I’ve had discussions about precisely that topic — land preservation and human exploitation — invariably, someone will say something to the effect of, well, you’re volunteering toward the same end, so you can photograph or view or be a part of their lives. But I can truthfully answer that even if I *never* set foot in a wild land again, even if I never had the opportunity to raise my lens and photograph another wild animal, even though I would miss that privilege, I would still work to the end of my days to ensure habitat and sanctuary for them, for their inherent value, for their intrinsic plan and purpose in this life. There are obviously a lot of people who either roll up their sleeves or donate money to habitat projects where they will never be able to set foot once completed. As you suggest, though, there are diminishing areas where this can even be the case. I always hope for some unexpected shift in consciousness that finally awakens the human spirit to the benefits of genuine coexistence.